The Gathering Rite includes a welcoming hospitality for the guests and candidates. The procession of the candidates precedes the procession of the celebrant, pastor, assisting priests, lector(s) and servers. The entire assembly is invited to join in singing the gathering song. The bishop or his delegate welcomes all, and begins the Eucharistic celebration. Because confirmation is celebrated during the Easter season, a sprinkling rite is common during the Gloria. The debate within the church about this sacrament is reflected in the variety of ages suggested for its celebration. In some places, the church confirms infants when they are baptized. 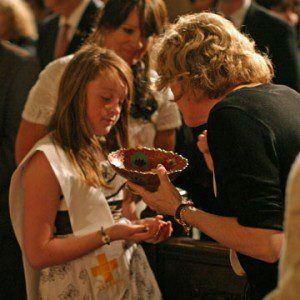 In other cultures, confirmation may come at the same time as first communion. The practice in much of this country is to confirm during the high school years, letting confirmation come as the mark of a more mature decision for membership in the church where the young person is invited to choose to follow Christ teachings as a Catholic. 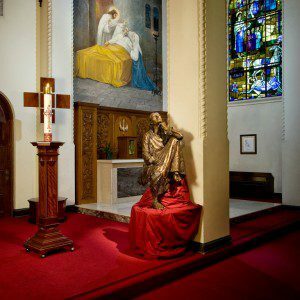 Confirmation is historically a sacrament of initiation, along with baptism and eucharist. In the liturgy, the presence of the candidates is primary. 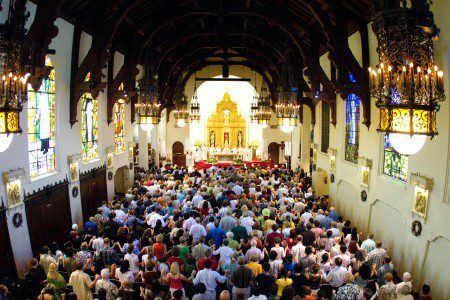 In fact, their presence is made to the whole parish in the weeks before the confirmation: by praying for them publicly, by the presence of the group with their sponsors at Sunday Masses, usually the 5:30 Mass. At the confirmation liturgy, their individual names need to be heard, and each face seen. They are not a “confirmation class,” a crowd of anonymous tenth graders and adults: They are so many individuals, each one of whom has requested confirmation and has been found ready, each one of whom has a sponsor and the pastor to testify to that readiness. The candidates and sponsors should help in the preparation of the confirmation liturgy, learning about and especially experiencing the power and the history of the laying on of hands and the anointing with perfumed oil. 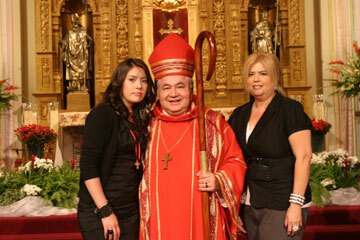 Confirmation ordinarily means the presence of the bishop. The liturgy is often simple, without additional elements that are intended to give solemnity but, in fact, obscure or weaken the central symbols of laying on of hands, anointing and eucharist. Preparation rites can set a festive mood. The liturgy of the word proceeds much as on any Sunday. In the rite of confirmation, after the gospel, the candidates are called by name; the bishop addresses the candidates in the homily. The rites that follow proceed without commentary or explanation. Everything is arranged so that the imposition of hands, with the silence that comes before, is a most powerful experience. That can happen when all attention is on the bishop and the candidates, when the silence is total, when the gesture is full and the prayer is well spoken or sung, when the “Amen” is like the great Amen at the conclusion of the eucharistic prayer. Then all should be able to see the chrism, the oil mixed with fragrant perfume and blessed by the bishop on Monday of Holy Week. The anointing is to make generous use of the oil, and the oil is not to be wiped off afterward; if anything, it should be rubbed in. The fragrance of the chrism should fill the whole room. The ves¬sel used for the oil, its rich fragrance, even carrying the oil in the entrance procession and honoring it with incense: All help to transform the anointing from a mysterious bit of tradition to a beautiful rite of the church, honoring and strengthening the presence of the Holy Spirit in its members. After the anointing, the table is prepared for the eucharist, for a festive banquet.